Erbil, Kurdistan Region, Iraq (cabinet.gov.krd) – Kurdistan Regional Government Prime Minister Nechirvan Barzani said up to this moment, there is no decision taken to postpone the Kurdistan independence referendum, planned to be held on 25 September. 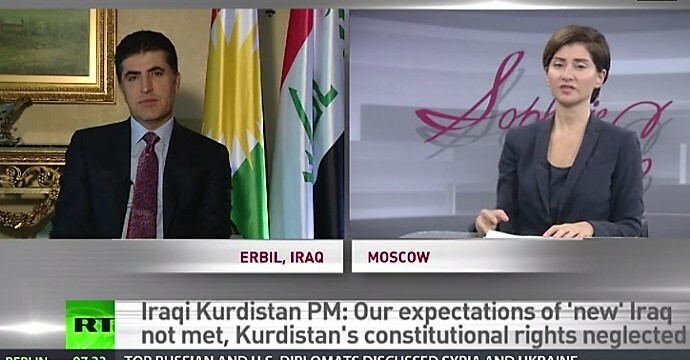 Prime Minister Barzani made the remarks in an interview with Russia Today television channel. Sophie Shevarnadze: Nechirvan Barzani, Prime Minister of Kurdistan regional government of Iraq, welcome to our show, it’s really good to have you with us. Now, Prime Minister, I have heard reports from the head of the Kurdish news network TV saying that the independence referendum will be delayed under pressure from Iran and the United States. Is this true? Nechirvan Barzani: Until this very moment, there’s no decision whatsoever to delay the process of a referendum to be conducted in Kurdistan region and the High Committee of Referendum that has been set up to preside over this process, they have to make the decision and the decision is that it will be held on 25th. Sophie Shevarnadze: So, Prime Minister, the visit of Brett McGurk hasn’t changed anything in terms of the referendum dates? 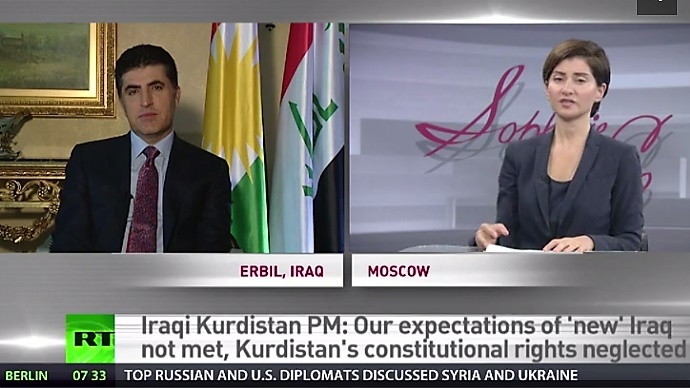 Nechirvan Barzani: In fact, the position of the United States that has been declared before and through the visit of Mr. McGurk basically to declare their position that the timing of the referendum might not be ideal or suitable and this is emphasized on the position that they have declared previously, and we have also said it clearly that the timing for such referendum is ideal. So, obviously, both sides have differences of position and discussions have been conducted around that. Sophie Shevarnadze: So if the Kurds vote “Yes”, you said you will not declare independence right away – why? Nechirvan Barzani: The question that should be asked is why we have come to the decision of having such a referendum. In fact, the reason for that amounts to the expectations that we’ve had from the new Iraq, and years of struggle and all the atrocities and the calamities that have been endured by the people of Kurdistan, and particularly in 2003 when we were convinced that there’s a new beginning of Iraq, it’s a new Iraq, it’s a democratic and federal Iraq that we will be living in on equal basis – but unfortunately for 12 or 13 years, after the Constitution that was voted on by the majority of the Iraqi people, unfortunately it has become irrelevant and it has been violated time and time again. Therefore, the expectations that we’ve had from new Iraq, they have not been met and there has been a lot of disappointment and loss of hope by the people of Kurdistan, in the present circumstances and the political climate in Iraq, and the sufferings continue – therefore, this is the reason that we had decided to go to the people in order for them to decide the future of Iraq. Sophie Shevarnadze: So, the war against ISIS appears to be drawing to a close. Iraq will soon have a chance to start political and economic reconstruction and hold parliamentary elections where Kurds will have the chance to have their say on the future of the united Iraq. Would that be more peaceful option than holding an independence referendum now? Nechirvan Barzani: In fact, when we talk about referendum on the 25th it doesn’t mean that the following day we will be declaring independence. Basically, the whole idea of holding such a referendum is to express the will and the desire of the people and the nation as a whole and it will be mandates for the political leadership in order to have further discussions and dialogue, in order to further this idea with Baghdad. As far as the issue of our war against ISIL – we have been successful in fighting ISIL and we will continue to cooperate with other security elements in Iraq and the Coalition in order to fight ISIL wherever they may be. We have been extremely successful in the level of cooperation that we’ve had with the Iraqi regular army. In order… talking about future elections and the prospect of changes – unfortunately, this will not enable us to recommend any changes. We are being told by the international community vis-a-vis the postponement of the referendum… there hasn’t been a presentation of a strong alternative that would convince us to proceed with the political process in Iraq. All we have been told is that the referendum should be postponed without any alternative that can replace the status quo that we have already. Sophie Shevarnadze: President Barzani said that the Kurdish partnership with Baghdad “failed”, which is one of the reasons for the independence drive. So how do you plan to build up those failed relations with Baghdad if the referendum succeeds? Nechirvan Barzani: Indeed, the referendum and post-referendum will be a process that will enable us to have serious discussion with Baghdad, and try to correct some of the wrongdoings of the past and it will put us in a better position. If you talk about the partnership or the new Iraq that has been built on that partnership – unfortunately, that partnership does not exist or it never existed in reality. Since 2005 when the Constitution was passed, unfortunately, we have been facing major difficulties. There are many examples that we can present whereby there has been violation of this partnership or the Constitution. As an example, I can tell you more recently when the Popular Mobilisation Force or, the Hashd Al-Sha’abi, the Shiite militia force that has been legitimized in the Iraqi Parliament, whereby all the needs were provided to them, with all the respect to Hashd Al-Sha’abi and the sacrifices that they have offered in fighting ISIL – everything was provided for them, at the time when the Peshmerga forces were in the same trenches as Hashd Al-Sha’abi and they have offered the same sacrifices – Baghdad was never ready to provide any kind of support or any encouragement, for that matter, for the Peshmerga forces. This is one of the clear examples that we have not been seen as equal partners. Secondly, where you have IMF and World Bank providing funds and assistance to Iraqi budget and development projects – unfortunately, none of that has been directed to Kurdistan region and this is, again, another solid example whereby we do not see partnership. There are many other examples that can be identified. We believe that after the referendum we will be able to have much more serious negotiations with Baghdad and to form a solid base on how to proceed and how to work and cooperate together. Sophie Shevarnadze: So what will be your course of action when Baghdad refuses to accept the vote result – because they’ve already said that the referendum will be unconstitutional. Nechirvan Barzani: They have already started. Baghdad has already started to reject the outcome, whatever it may be, and the Iraqi Parliament has already voted on that. But, I can say it clearly, this will not have any impact on the process. Sophie Shevarnadze: No, I’m sure the referendum will take place, the question was: what will be your course of action, what are you planning to do once they refuse to accept the referendum? Nechirvan Barzani: Our expectation is not to antagonize the situation further on the basis of the results of the referendum. Our desire and our aim is to push for a serious engagement with Baghdad, to have serious talks and for them to be forthcoming and for us to be forthcoming in order to have much more solid and serious debate on the future prospects. Sophie Shevarnadze: President Barzani said that Iraqi Kurds are “prepared to draw their own borders” once Baghdad refuses to accept the independence vote. Are you ready to go as far as military confrontation with Baghdad to keep these borders? And, of course, mainly, we’re talking about Kirkuk here. Nechirvan Barzani: The referendum will not define the boundaries of Kurdistan region. This can only be achieved through serious dialogue with Baghdad. In fact, we, in Kurdistan region, the people of Kurdistan and the Kurds in particular do not want to impose our will on the populations and other ethnicities in this region – such as Arabs, Turkmens, Christians and all other components in various areas that are living within these borders. It is through their own allegiance, their own desire how they want to vote, whether to be part of this administrative region or not. This is entirely a democratic process for them to decide, and defining the border will be left to discussions and dialogue with Iraq. Sophie Shevarnadze: You partially answered my question, but precisely – we want to know about Kirkuk, what if people of Kirkuk will vote to remain under Iraqi governance and the rest of Iraqi Kurdistan votes to separate – what will happen? Because we’re kind of seeing the same thing with Brexit and Scotland right now. Nechirvan Barzani: With regard to Kirkuk, again, it’s an issue that will be entirely left for the population. We are not imposing any solutions on Kirkuk. The special status of Kirkuk and the composition of the communities, of Arabs and Turkmens and Christians and Kurds of course, this is something which has to be taken into serious consideration. Within the Kurdistan Administration, the Kirkuk region can enjoy its… as a region of self-administration and the special status of the communities and the components should be guaranteed and secured. We are not planning to impose one-sided or unilateral solution to that of Kirkuk. It is entirely left to the people of Kirkuk and special status and special arrangements have to be made for the administration of Kirkuk in future. Sophie Shevarnadze: I understand that you’re not going to impose your will on anyone, but the Kurdish Peshmerga has played a huge role in driving ISIS out of Mosul. Are you maybe going to take advantage of the war right now and take more territory from the jihadis and try to include it into the independent Kurdistan? Nechirvan Barzani: In fact, we do not wish and desire to have to impose it as a kind of de-facto, and under the present circumstances… But there are certain realities that need to be taken into consideration. When prior to the fall of Mosul in 2014, we had offered the Peschmerga protection and participation to protect Mosul at that time for then the PM of Iraq, but unfortunately, Baghdad was negative in responding to such a proposal and happened what had happened and Mosul fell. Immediately after that, upon the request of then the PM, we had provided security and Peshmerga forces to Kirkuk and its immediate environment in order to protect this region from falling under the onslaught and attacks of ISIL. Had we not sent Peshmergas to those regions -perhaps the fate of Kirkuk would have been far worse from what had happened in Mosul. The presence of Peshmerga was intended to protect the territories plus all the components of the Kirkuk region. We need to talk to Baghdad in order to define the boundaries, administrative boundaries of the Kurdistan region, and not to impose anything. We feel that this can only be concluded through common understanding and serious engagement with Baghdad. Sophie Shevarnadze: Now, with oil prices remaining low, are you afraid that independent Kurdistan with an oil-dependent economy will not have money to survive or will not have enough money? Nechirvan Barzani: Indeed, the economical situation of the Kurdistan region over the past three years is not an ideal one. The economical crisis cannot be all attributed to the fall of the oil prices. Yes, indeed, the fall of oil prices has affected us, but at the same time we also have to remember that since the beginning 2014, before the war with Daesh or ISIL, Baghdad unilaterally had cut the budget of Kurdistan. For three years we have been facing difficulties because of lack of budget coming from Baghdad, and secondly, facing 1100 km of warfare against the most dangerous terrorist organization of ISIL, that also put on us a great deal of pressure, and the war on ISIL and the capture of many areas by ISIL – this also resulted in 1.8 IDPs coming to Kurdistan – this also added to the economical difficulties and strains that we had, which is still continuing. Although, this year, we feel there are certain indications of improvement of our economy and we expect there will be further development and we also try very hard to introduce reforms and not to rely solely on oil generated revenue, but also to diversify our economy. Sophie Shevarnadze: Do you think that Kurdistan’s independence could scare foreign investors away? Nechirvan Barzani: In fact, as I mentioned earlier, immediately after the referendum has been carried out, it doesn’t mean that we will be declaring independence, but what we would like to do is to enter serious dialogue with Baghdad and to try to bring up all the pending issues that we can resolve through dialogue and serious engagement with Baghdad. In addition to that, we have proven that we are a factor of stability in the region for the last couple of decades and we certainly try to continue to go in that direction to be a factor of stability in this region. Sophie Shevarnadze: When Kurds got their de-facto autonomy from Baghdad in the ’90s, after the Gulf war, they immediately turned against each other in a civil war lasting years. Now, President Barzani said he’s stepping down once Kurdistan goes independent, and there will be a presidential vote in November. Is there risk of violent instability in independent Kurdistan? Nechirvan Barzani: Indeed, what had happened as an internal conflict, it was a sad chapter in our history, but it’s a chapter that has been closed and I don’t believe the circumstances would allow this internal conflict to erupt again. As far as the position of the president Barzani, on numerous occasions he had declared very clearly that he will not stand for re-election or to present his candidacy for presidential election. He will respect and honor that and he will respect the laws of Kurdistan region, and that is the position that he has expressed explicitly. Sophie Shevarnadze: Now, Prime Minister, one of the reasons why ISIS marched into Iraq in the first place is political and sectarian divisions within the country. Have you thought about it? How can you be sure that Kurdish independence will not trigger an even deeper divide that will actually plunge the region into a worse chaos? Nechirvan Barzani: In fact, if you have a realistic approach vis-a-vis the contribution of Kurdish leaders since 2003, both honorable Barzani and Talabani have contributed a great deal to rebuilding Iraq and with a promise that it will be a new Iraq for all of us, but unfortunately this has not gone in the right direction, and for the last 12 years of so we have been waiting for implementation of Constitution but it’s been violated and it hasn’t been honored. So, really, at the end of the day, after 12 years or so, or after all that we have done to rebuild Iraq, a new Iraq, a new chapter, we ask a question – where do we stand? And after all these difficulties that we are facing on daily basis with Baghdad, this is all that we can do, what we have done so far, we cannot contribute further, we cannot improve it further. And what is being said in terms of stability or unity of Iraq which the international community continuously emphasizes about one Iraq, or united Iraq – this, as a slogan, maybe, an approach of the politicians. But in reality, on the ground, Iraq is not one and Iraq is not united and we as Kurds are not the ones to be blamed for this happening in the rest of Iraq, and the wrong directions that Iraq has gone through. What we are trying to do, when we talk about independence of Kurdistan, it’s not to complicate the situation and add further to the problems that exist in this country. Quite on the contrary, we feel that independent entity will be a factor of stability, and the wrongdoings and the instabilities that exist in the region, it’s not doing of the Kurdish people, it is not our fault that Iraq has gone into that direction. Sophie Shevarnadze: President Barzani said that the “spirit of colonial era borders” in the Middle East, like the Sykes–Picot Agreement is over and the region needs a new formula that will include independent Kurdistan. What other new things do you hope this formula to include? Do you think that Iraq and Syria will survive in their current form? Nechirvan Barzani: When the issue of independence has been brought about and been discussed, we solely and purely talk about what we have in Iraqi Kurdistan and the Kurdistan region within Iraq. The issue of beyond the boundaries of the Kurdistan region – it is not something that we would like to interfere. However, we would like to see the issue of Kurdish people in Syria to be resolved democratically and peacefully. But our responsibility is primarily and solely for Kurdistan region of Iraq. Sophie Shevarnadze: During a telephone conversation with U.S. Secretary of State Rex Tillerson last month, your president, president Barzani asked for “guarantees” and “alternatives” for Kurdistan’s future in exchange for holding back a referendum. As far as I understand, no such guarantees were given. What exactly could they be? And will you proceed without them? Nechirvan Barzani: For us, the important question that has been all along to the international community and the U.S.is that when it has been mentioned that if the referendum can not take place or it can be delayed or the time is not right – our counter-question is, “if referendum is such a bad thing, then what would be the alternative?”. And if the timing is not right, then can you define what will be the right time for us? And so far, we don’t have a response to these questions. Sophie Shevarnadze: The current Turkish government is in conflict with the Kurdish forces at home as well as the Kurdish quasi-state in Syria. But you have good relations with the Turkish government, certainly the Iraqi Kurdistan independence will embolden those forces. Do you feel your relations with Turkey will suffer as a result? Nechirvan Barzani: In fact, the issue of referendum, we believe, internationally has been exaggerated, it has been taken out of proportion. it should be seen as it is, for what it is and what purpose it serves. Again, I want to emphasize that the day after the referendum has been conducted doesn’t mean that we will be in the position to declare independence. Indeed, we do enjoy good relations with Turkey, both politically, socially and economically. And definitely we do not want to spoil that, and we value those relations with Turkey and we do not want this process that we have embarked upon to be a reason for undermining our relations with Turkey, and we hope that there would be more understanding and more communication and we are ready to communicate further upon this issue, and there should be understanding internationally that the day after referendum will not mean a declaration of independency and it should not be overexaggerated. Sophie Shevarnadze: Prime Minister, I want to sum up your vision of what this referendum could entail in the future. Hypothetically speaking, can an independent Iraqi Kurdistan ever grow to include the Syrian Rojava and Afrin and morph into a greater Kurdish nation? Nechirvan Barzani: We don’t have such an agenda or vision, that we want to enlarge our boundaries beyond what we have already. Our boundaries are defined and will be defined within the Iraqi Kurdistan and that’s it. Sophie Shevarnadze: I want to finish this interview with a question about Russian-Kurdish relations. Earlier this year, you signed a $1 bn dollar oil contract at the St.Petersburg International Economic Forum which has given Russian oil giant Rosneft access to the vast Kurdish oil reserves for the next 20 years. Do you see that as Russia’s support for Kurdistan’s independence, or is this just business? Nechirvan Barzani: Like any other international company, who have invested into the oil sector in Kurdistan, Rosneft has also been welcomed by the same token that the international companies, that are active and will be acting as an investment and it should not be seen as an official position from Russia for direct support of an independent entity. This purely has trade and business and economical dimension.